Transverse rumble strips (TRSs) (also called in-lane rumble strips) have been used by some agencies to warn drivers in rural areas that they are approaching a stop sign. The strips typically consist of grooves crossing the roadway surface to provide a tactile and audible warning for drivers. Figure 1 shows an example of TRSs on a rural road in Minnesota. Figure 1. Photo. TRSs on a rural road in Minnesota. The objective of this effort was to examine the impact of TRSs on crashes, specifically total crashes, injury crashes, and specific crash types, such as right-angle and run stop sign crashes. The effort also included an economic analysis to investigate the tradeoffs between different crash types. It could be hypothesized that the major effect of TRSs would be to reduce instances of drivers failing to stop at an intersection because they are unaware of the intersection (or stop sign) presence (i.e., reduce run stop sign crashes). However, by increasing the driver’s awareness of the upcoming intersection, the TRSs might also affect crashes where the driver stops at the sign but then pulls out into the path of an oncoming vehicle (i.e., reducing right-angle crashes). Thus, analysis of both is warranted. To control for possible regression to the mean and other biases, an empirical Bayes (EB) methodology was used. (4) With this methodology, a prediction of what would have happened at the treatment sites in the after period without treatment is based on a weighted combination of two factors: (1) the frequency of crashes on the treated sites in the before period, and (2) crash-frequency predictions from regression models developed with data from similar but untreated reference sites. The prediction of what would have happened without treatment is then compared to what actually happened with treatment to estimate the safety effect of the treatment. Annual factors are estimated for each year to correct for changes in factors such as weather, crash reporting practices, and demography over time. This methodology corrects for the regression bias, changes in traffic volume at the treatment sites, and other possible confounding factors. The Iowa Department of Transportation (Iowa DOT) and Minnesota Department of Transportation (MnDOT) provided data on rural intersections with minor-leg stop control where TRSs were introduced. The following sections summarize the design of TRSs and the data that were collected in these two States. Initially, Minnesota used a full-lane width pattern for their TRSs. The pattern was changed to a wheel path pattern so that motorists who are aware of TRSs (i.e., local drivers) and bicyclists could avoid the pattern. An approach to a stop-controlled intersection can have up to five sets of TRSs, but a minimum of three sets are recommended. If three sets are used, the first set of TRSs encountered by the driver is located 250 ft (75 m) before the “Stop Ahead” sign. TRSs closest to the intersection are usually located about 500 ft (150 m) from the stop sign. The set of TRSs in the middle are typically located 15 ft (4.5 m) before the TRSs that are closest to the intersection. The length of each TRS panel is about 5 ft (1.5 m). Figure 2 shows an illustration plan view of TRSs in Minnesota. Figure 2. Illustration. Plan view of TRSs in Minnesota. In Iowa, until 2006, three sets of TRSs were required, with the first TRS encountered by the driver 200 ft (60 m) in advance of the “Stop Ahead” sign. The TRS closest to the intersection was 300 ft (90 m) in advance of the stop line, and the center one was midway between these two. This standard was altered in April 2006 and again in May 2007 to require only two sets of TRSs, removing the TRS closest to the intersection (see figure 3). Currently, each TRS panel is 24 ft (7.2 m) long and consists of 25 grooves placed at 1-ft (0.305-m) intervals perpendicular to the centerline. An 18-inch (457.2-mm) width of pavement at the outside edge of the lane is left uncut to accommodate bicycles. Figure 3. Illustration. TRS placement in Iowa. In order to account for biases in treatment site selection, reference sites were identified (i.e., intersections that were similar to the treatment sites but which did not receive TRSs). In Iowa, reference sites were identified by Iowa DOT. In Minnesota, data from the Highway Safety Information System were used to identify stop-controlled intersections on rural roads similar to the treatment sites with respect to traffic volume, presence of lighting, and the number of lanes on the major approaches. Table 1. Data summary of treatment sites in Minnesota and Iowa. Safety performance functions (SPFs) are used in the EB methodology to estimate the safety effectiveness of this strategy. SPFs relate crashes of different types to traffic flow and other relevant factors for each jurisdiction based on similar untreated sites. SPFs were estimated for different levels of crash severity including total, KABC, KAB, and KA crashes using data from reference groups in Minnesota and Iowa. Generalized linear modeling was used to estimate model coefficients using SAS® and assuming a negative binomial error distribution, which is consistent with the state of research in developing these models. (7) While estimating the SPFs, if a variable did not significantly improve the model, it was removed. This section provides a discussion of results, focusing on the results that were statistically significant. Results are expressed in terms of a crash modification factor (CMF). A CMF of 1.0 indicates that the treatment had no effect. A CMF greater than 1.0 indicates that there was an increase in crashes due to the treatment, whereas a CMF less than 1.0 indicates that there was a decrease in crashes due to the treatment. In Iowa, total and PDO crashes seem to have increased at the TRS sites. However, none of the increases were statistically significant within a single intersection type. For PDO crashes, the increase for the three- and four-leg intersections combined was statistically significant at the 0.10 significance level. To determine the possible reasons for this increase, each site was examined to identify potential outliers, which may have caused significant changes to the results; however, no such outliers were found. KABC crashes (i.e., all crashes involving injury) seem to have decreased by about 7 percent at four-leg intersections, but this change was not statistically significant. Severe injury (KAB) crashes decreased at both three- and four-leg intersections. The reduction at four-leg intersections was about 25 percent. In the combined sample of three- and four-leg intersections, the reduction was about 20 percent. Both were statistically significant at the 0.10 level. Similarly, KA crashes decreased at both three- and four-leg intersections. The reduction at three-leg intersections was quite large (about 67 percent); however, this was based on an extremely low number of expected crashes (six crashes) in the after period. As a result, it was not very reliable, even if it was statistically significant. For the combined sample of three- and four-leg intersections, there was about a 30 percent reduction in KA crashes, which was statistically significant at the 0.10 significance level. These results indicate that the TRSs may be effective in reducing more severe injury crashes. Iowa DOT provided data on crashes that involved drivers running stop signs. Results indicate that these crashes seem to have decreased by 18 to 20 percent, but none of these reductions were statistically significant. Right-angle crashes were not examined in Iowa because less than 10 crashes were reported in the after period for three- and four-leg intersections combined. Similar to the results from Iowa, total and PDO crashes in Minnesota seem to have increased following implementation at three-leg intersections and at three- and four-leg intersections combined. However, none of the increases were statistically significant. The only results that were statistically significant were the reductions in KA crashes at four-leg intersections and at three- and four-leg intersections combined. However, these reductions were based on a very limited sample and, as a result, were not reliable even if they were statistically significant. Right-angle crashes seem to have decreased at three-leg intersections, but this reduction was not statistically significant. While right-angle crashes seem to have increased at four-leg intersections, this increase was also not statistically significant. Run stop sign crashes could not be examined since such crashes could not be identified based on the variables in the Minnesota crash file. To determine the possible reasons for the apparent increase in total and PDO crashes at the TRS sites in Minnesota, each site was examined to identify potential outliers which may have caused significant changes to the results. While this examination revealed one possible outlier, removing it did not provide additional insight into the apparent inconsistencies in the results. Table 2 shows the combined results from Iowa and Minnesota. All intersections from Iowa and Minnesota were considered while combining the results. The table includes the observed crashes in the after period, the EB estimate of the crashes expected in the after period had there been no treatment, CMF, and the standard error of CMF. CMFs that are statistically significant (i.e., statistically different from 1.0) at the 0.10 and 0.05 significance levels are shown, as well. Table 2. Combined results of before-after evaluation from Iowa and Minnesota. *CMF is statistically significant at the 0.10 level. **CMF is statistically significant at the 0.05 level. For three-leg intersections, the only statistically significant result was a reduction in KA crashes; however, this was based on a very small sample size and, hence, is not reliable. For four-leg intersections, there was a statistically significant reduction in KA and KAB crashes. For three- and four-leg intersections combined, there was a statistically significant increase in PDO crashes (about 19 percent) but a statistically significant reduction in KAB crashes (about 21 percent) and KA crashes (about 39 percent). The fact that the results indicate decreases in severe crashes coupled with increases in PDO crashes is of interest. Such increases in PDOs could result from either shifts from more severe to less severe crash types (e.g., right-angle crashes decrease while rear-end crashes increase) or from a shift from more severe to less severe crashes within the same crash type (e.g., angle crashes are not eliminated but are made less severe). An attempt was made to examine shifts in crash types, but it was not possible due to small sample sizes. In an attempt to draw conclusions given the tradeoff, a simplistic economic analysis was conducted using only the combined three- and four-leg results from table 2. The results are shown in table 3. Based on a report from the Federal Highway Administration, at the time of this study, the mean comprehensive cost of a PDO crash in a rural area in the United States was $7,800, the mean cost for a C injury crash was $49,549, the mean cost for a KAB crash was $353,359, and the mean cost of a KA crash was $662,817. (8) The differences in observed and expected crashes (shown in the table under the column “Crash Increase or Decrease”) was multiplied by the appropriate crash costs for each severity category to estimate the increase or decrease in crash harm associated with the changes in the three different crash types. By comparing the crash harm estimates for KAB crashes with PDO and C injury crashes, a benefit of $6,683 per intersection per year was estimated. Similarly, by comparing the crash harm estimates for KA crashes with PDO and C injury crashes, a benefit of $8,168 per intersection per year was estimated. Based on either approach, it is clear that there was a significant reduction in crash harm due to the installation of TRSs. Table 3. Economic cost of crashes for selected crash severity levels. This study investigated the safety effect of TRSs on approaches to stop-controlled intersections using the state-of-the-art EB methodology. Results indicate that TRSs may be effective in reducing severe injury crashes (KAB and KA) at minor road stop-controlled intersections. Considering that many previous studies showed a reduction in speed following the implementation of TRSs, the decrease in KAB and KA crashes could be a result of reduced speeds. (1,2) However, it is important to recognize that coupled with the reduction in KA and KAB, there was an increase in PDO crashes. While it was not possible to determine the reasons for this tradeoff, a limited economic analysis indicated a reduction in crash harm of about $6,600 per intersection per year due to the installation of TRSs. Since most TRSs are installed at rural intersections with relatively low volumes and hence relatively few crashes, a large sample of intersections with long before and after periods are required to find statistically significant results, especially since the reduction appears to be for severe injury crashes only. Further research on this topic should attempt to collect data from other States that have implemented TRSs and also examine the effect on other crash types such as run-off-road and sideswipe crashes at or near intersections. Additional research should also investigate the effectiveness of this treatment under a variety of conditions, including the number of driveways, nature of the surrounding development and roadside hazards, and sight distance. The research was conducted by Raghavan Srinivasan, Jongdae Baek, and Forrest Council of the University of North Carolina Highway Safety Research Center. Further details about the evaluation are available in Safety Evaluation of Transverse Rumble Strips on Approaches to Stop-Controlled Intersections in Rural Areas, which was presented at the 2010 Annual Meeting of the Transportation Research Board. (9) A slightly revised version of the paper was published in the Journal of Transportation Safety & Security. (10) For more information about HSIS, contact Carol Tan, HSIS Program Manager, HRDS, (202) 493-3315, carol.tan@dot.gov or Ana Maria Eigen, HRDS, (202) 493-3168, ana.eigen@dot.gov. Fitzpatrick, K., Brewer, M.A., and Parham, A.H. (2003). 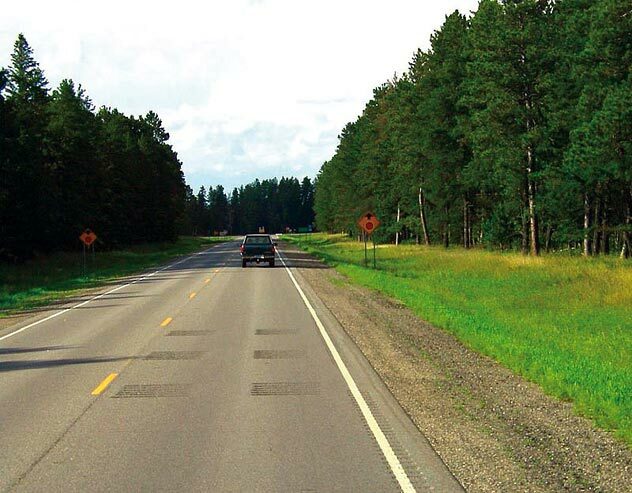 Left-Turn and In-Lane Rumble Strip Treatments for Rural Intersections, Report No. FHWA-TX-04-0-4278-2, Texas Department of Transportation, Austin, TX. Harder, K.A., Bloomfield, J.R., and Chihak, B.J. (2006). Stopping Behavior at Real-World Stop-Controlled Intersections With and Without In-Lane Rumble Strips, Report No MN/RC-2006-42, Submitted to Minnesota Department of Transportation, St. Paul, MN. Harwood, D. (1993). “Use of Rumble Strips to Enhance Safety,” NCHRP Synthesis of Highway Practice 191, Transportation Research Board, Washington, DC. Hauer, E. (1997). Observational Before-After Studies in Road Safety: Estimating the Effect of Highway and Traffic Engineering Measures on Road Safety, Pergamon Press, Elsevier Science Ltd., Oxford, United Kingdom. MnDOT. (1999). Traffic Engineering Manual, Minnesota Department of Transportation, St. Paul, MN. SAS®, SAS Institute Inc., Cary, NC. Srinivasan, R., Baek, J., and Council, F.M. (2010). Safety Evaluation of Transverse Rumble Strips on Approaches to Stop-Controlled Intersections in Rural Areas, 2010 Annual Meeting of the Transportation Research Board, Washington, DC. Srinivasan, R., Baek, J., and Council, F.M. (2010). “Safety Evaluation of Transverse Rumble Strips on Approaches to Stop-Controlled Intersections in Rural Areas,” Journal of Transportation Safety & Security, 3(2), 261–278.